But no Rutgers alum has accomplished more in the NFL than Patriots free safety Devin McCourty. Drafted in the first round of the 2010 NFL draft, Devin has been as consistent of a defensive back as you can ask for. With 30 total turnovers, over 700 total tackles, five Super Bowl appearances, and a couple of Pro Bowl nod to his name, Devin is underrated by NFL standards. But this production has ensured him a steady starting job and plenty of post-season success as a member of one of the most successful franchises in NFL History. The same couldn’t be said for his twin brother, cornerback Jason McCourty. Drafted in the 6th round by the Tennessee Titans in 2009, Jason hasn’t had as fruitful of a career as his brother Devin. During his eight-year tender with Tennessee, Jason had pretty decent numbers, but could never get his team past the regular season. Injuries also took a toll on him, suffering injuries in his hamstring, arm, groin, & chest. He was released by the Titans because he wasn’t willing to take a pay cut. He spent the 2017 season with the worst team in the league that year: the Cleveland Browns. That is not an exaggeration; Cleveland did not win a single game that year, becoming the second team in NFL history to go 0-16 in the regular season. McCourty started 14 games that season, missing weeks’ 7-8 due to an ankle injury. He finished with 69 combined tackles (60 solo), 12 pass deflections, two interceptions, and a touchdown. The way his career was going, Jason might have been on his way out of the NFL by the next season. But, as a good brother should, Devin stepped in to remedy the situation. “Dev texted Bill [Belichick] in March and said 'Two McCourtys are better than one.' Tonight, I think Bill agrees. So I'm happy with it," Jason said during his post-Super Bowl interview with NFL Network. In March of 2018, the Cleveland Browns traded McCourty & a 2018 seventh-round draft pick to the Patriots for a sixth-round pick of the same year. For the first time since 2008, the McCourty twins were back on the same team. Which not only benefited Devin & Jason but also Patriots coach Bill Belichick. When the McCourty twins played together during their college years at Rutgers, they made for an unstoppable duo in the secondary. From 2006-2008, under head coach Greg Schiano, the McCourtys helped the Scarlet Knights make three bowl games (winning two of them), amassing a 27-12 record in the process. Together, the twins combined for seven interceptions & 198 total tackles when they shared the field. As NFL teammates, it was like that chemistry never dissipated. In 2018, the Twins combined for two interceptions (one each), a forced fumble (Jason), two fumble recoveries (both by Devin), 14 deflected passes, & 152 combined tackles. All that helped lead New England on a Super Bowl run like no other, taking down up-and-coming teams in the Los Angeles Chargers and teams that have revolutionized NFL offenses in the Kansas City Chiefs & Los Angeles Rams. And despite Devin having more experience (and success) in the big game, it was Jason that made one of the biggest plays of the game. With L.A.’s offense finally gaining some momentum late in the third quarter, quarterback Jared Goff play-action to the left side and saw a streaking Brandin Cooks, who was wide open in the endzone. This was due to a break in coverage by safety Duron Harmon, who filled in place of an injured Patrick Chung. According to Next Gen stats, Jason was 19.2 yards away from Cooks at the point of release by Goff. Sprinting to the endzone, Jason somehow got to Cooks just as the ball was in his hands. He knocked the ball right out of Cooks’ clutches, causing him to drop a sure-fire touchdown in the endzone. Goff would fire more desperate long balls to the endzone as the game went on, with one of them being intercepted by All-Pro cornerback Stephon Gilmore. But had Jason not made it to Cooks just in time to break up the pass, The Patriots might not have won this game as convincingly, if at all. But being a twin carries so much more. You’ve literally known this other person your entire life. They are your best friend. They are also your worst enemy. No one knows you better than the person that looks exactly like you (in the case of identical twins). So, for a set of twins like my brother & I, to see another set of twins not only play American football at the highest professional level & succeed at it but to see them become the first twin brothers ever to win the Super Bowl on the same team is quite astonishing. It made us think that if we had embraced our twinness more in the past instead of trying to live our lives away from it, what would we have accomplished? Would we be different people? My brother and I are nearly inseparable. Like the McCourtys, we played our fair share of sports in high school (I was an offensive lineman, he was a goalkeeper). The general stereotype about twins is that we are all the same; same likes & dislikes, same clothes, same careers, etc. But that’s not entirely true. In some cases, twins want to form their own identity. It gets tiring to constantly be mistaken for the other person, especially when your own friends won’t come up to say hi because they think you’re the other one. Twins try to make themselves as contrasting to each other as possible. Take my brother and me; I am a sports writer obsessed with American football. He is an aspiring novelist that draws inspiration from ancient myths & comic books. I style my hair like a wave, while he shaves his head. I love sushi, he hates it. The list goes on. And there’s nothing wrong with wanting to be different from your twin. Some pairs just want to be different and be recognized as an individual. 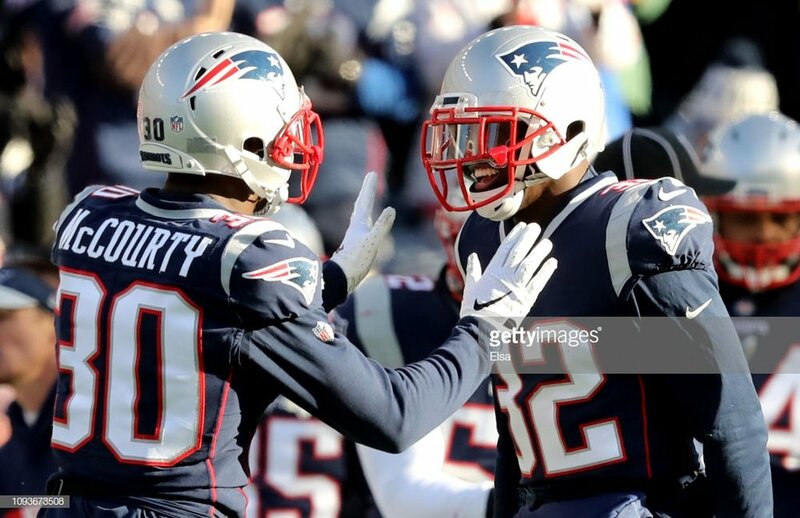 Others, like the McCourty twins, embrace the bond to the fullest extent. Yes, they both play football. And yes, they both play similar positions. But the McCourtys have extended their similarities to activities outside of the gridiron. Both brothers run the “McCourty Twins Tackle Sickle Cell” foundation, a philanthropic organization dedicated to “…educate the public, increase blood donations, and raise money & awareness for the fight against sickle cell disease.” (Link to Donate). They also run the “Double Coverage” podcast, where, according to Patriots.com, the brothers record each episode in Devin’s basement, where they alter between talking about simple things like date nights & dad stuff to serious social issues & NFL-related content. In conclusion, if anyone reading this is a twin, know that you are very lucky. You have someone in your life that you can trust, someone that knows what you want when no one else does. Whether you want to be alike or different isn’t what should matter. It’s that you have a guaranteed person in your corner at all times, no matter what. To paraphrase Jason, two of us is better than one.